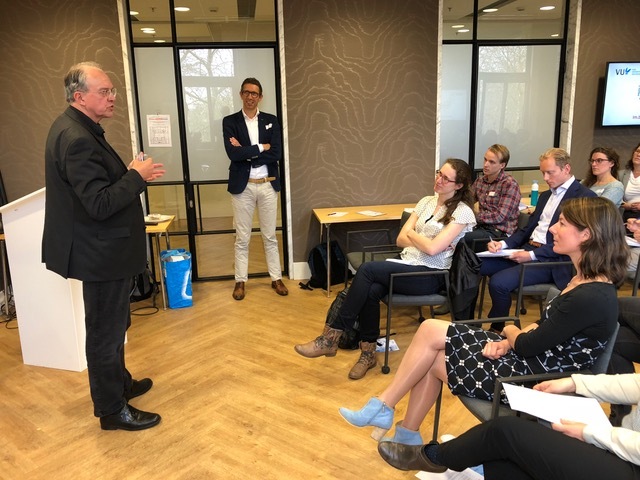 In the afternoon of Wednesday April 11th, the Netherlands Heart Institute hosted a scientific session on "Promoting transparency in preclinical research". The well attended session consisted of presentations and a open discussion, with speakers and participants from Tilburg University, Radboud MC, UMCU, DANS, VUmc, KNAW, NHI, ZonMW, and the Dutch Heart Foundation. The afternoon was opened by Prof. Steven Chamuleau (UMCU), after which different speakers presented possible solutions to promote research integrity and transparency. Marjan Bakker (Tilburg University) explained how in the field of psychology, scientists, professional associations and journals are successfully joining forces to implement preregistration of scientific studies. Kim Wever (SYRCLE, RadboudMC) and Mira van der Naald (UMCU) spoke about potential biases in experimental animal studies and the necessity of preregistering animal studies, which is possible at preclinicaltrials.eu. Peter Doorn (KNAW, DANS; Data Archiving and Networked Services) highlighted the importance of data sharing and explained that different funding agencies require a data management plan for funding proposals. Lex Bouter (VUmc, KNAW) talked about current research integrity and reproducibility issues and emphasized that a re-design of the scientific reward system could improve current replicability crisis. The session ended with lively debate nicely moderated by Rinze Benedictus (UMCU, Science in Transition). Obviously, all participants recognize the importance of open access publications, data sharing, publishing negative findings and preregistration. Also, the preclinicaltrials.eu website is seen as a great initiative and further strategies were discussed to align scientists, scientific journals and funding agencies to stimulate the preregistration of experimental animal studies.